I bought this beautiful Top Sirloin from Novy Ranches at the Channel Islands Farmers’ Market this morning. John cooked it according to the instructions they gave us. 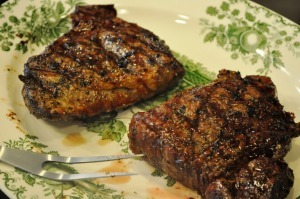 He rubbed it with Olive Oil and sprinkled it with Salt and Pepper, then seared it over medium-high heat and moved it to the top shelf of the grill and allowed it to cook for about 6 minutes on each side. While the meat rested, we made the Crab topping. When it was thoroughly combined, we created 4 small mounds of the Crab mixture on a parchment-lined baking sheet, topped each with a bit of Italian Blend Cheese, and placed it under the broiler for about 3 minutes. Place slices of meat on each plate, then top with Crab and Cheese patty. 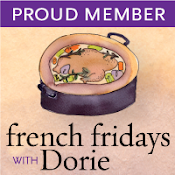 This week’s French Fridays with Dorie recipe is for Roasted Cherry Tomatoes. 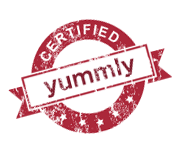 I used a variety of Cherry Tomatoes and doubled the recipe. I topped the Tomatoes with fresh Thyme and Lemon Thyme from my garden and slow-roasted them for 3 hours. 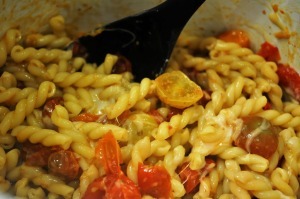 When the Tomatoes were done, I tossed them with a pound of Gemelli pasta and 8 ounces of Smoked Mozzarella Cheese. It was really delicious! I loved the roasted Garlic, too, and will add more next time. This is the fourth recipe we’ve tried from David Lebovitz’s book, The Perfect Scoop, and each one has been incredibly delicious! I’ve never had Lemon Ice Cream before, but this was so creamy and delicious that I could have eaten half of it myself! When I was a kid in Naples, I used to get Gelato cups with half-Lemon and half-Strawberry – they were my favorite! 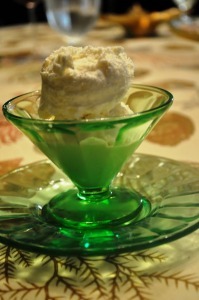 My next step will be to combine this amazing Lemon Ice Cream with Strawberry Ice Cream! I love this book, and my sister-in-law suggested I sponsor an on-line group to work our way through The Perfect Scoop – what do you think? Are you game? Fabulous meal as always, Susan! Those steaks look amazing…and you did a lovely job with your roasted tomatoes, too. I’d love to watch you churn your way through David’s book…and I might even be able to join you on occasion (I’ve failed miserably with Baked Sunday Mornings so far, though!). Have a great week! 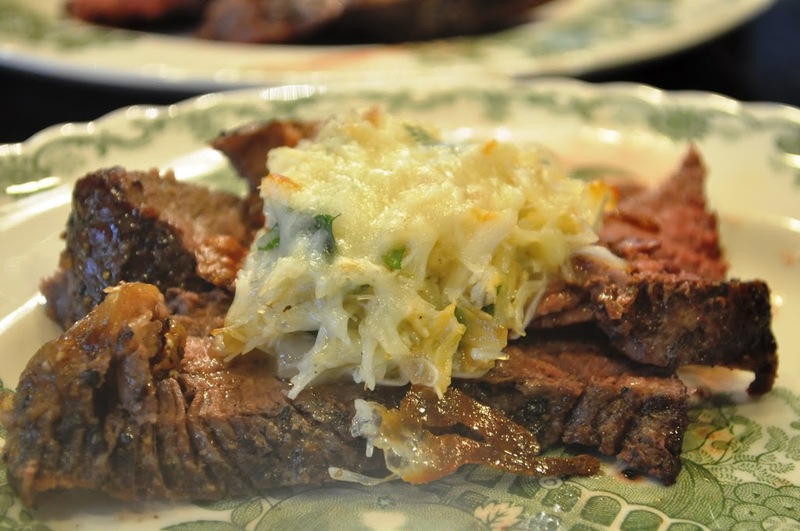 Your steaks topped with crab are beauties, you’ve done them proud! Susan, You always do such lovely meals! The crab top steaks look fabulous! 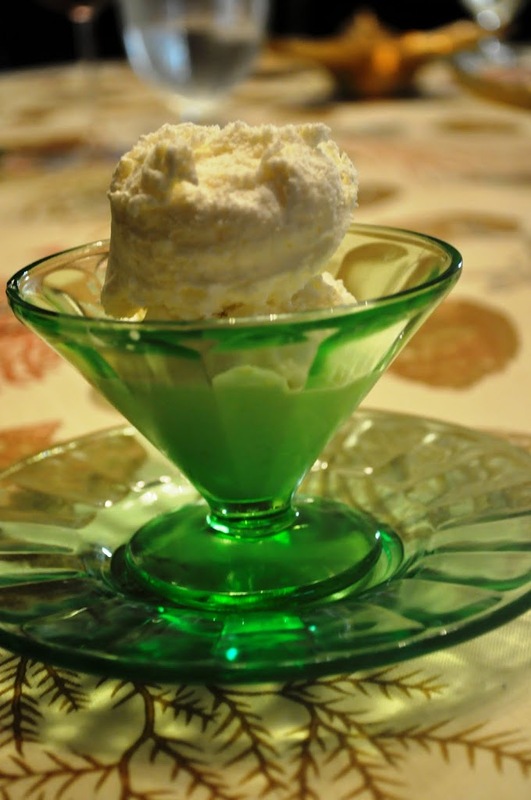 I also have The Perfect Scoop but have not yet ventured that far into it…I did make the green tea ice cream and it reminded me of Starbucks green tea latte…yum! Nice post! Your salad looks great!! 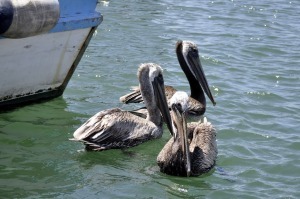 Did you put any kind of dressing or sauce on the salad? I just purchased that book (The Perfect Scoop) and made his peach ice cream yesterday. So tasty! I LOVE lemon desserts so I will definitely be trying the lemon ice cream. Happy to hear that it got good reviews in your house. It’s only noon, but photos are making me so hungry for dinner!! 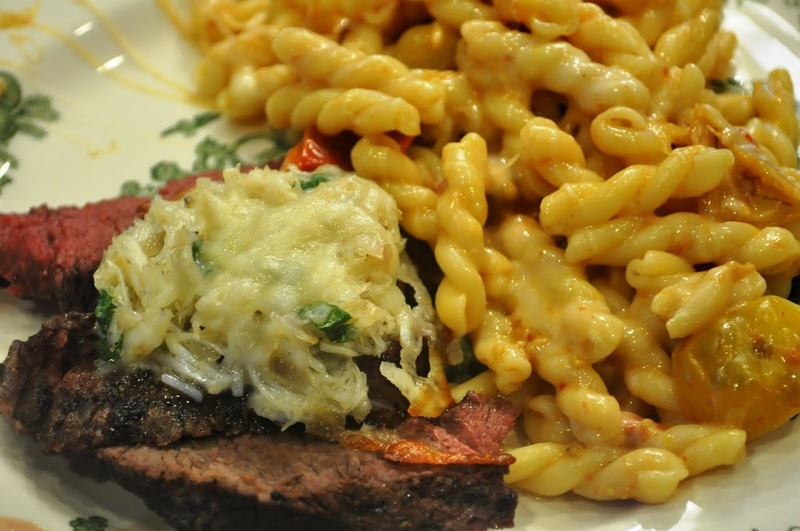 That crab topped steak looks amazing! 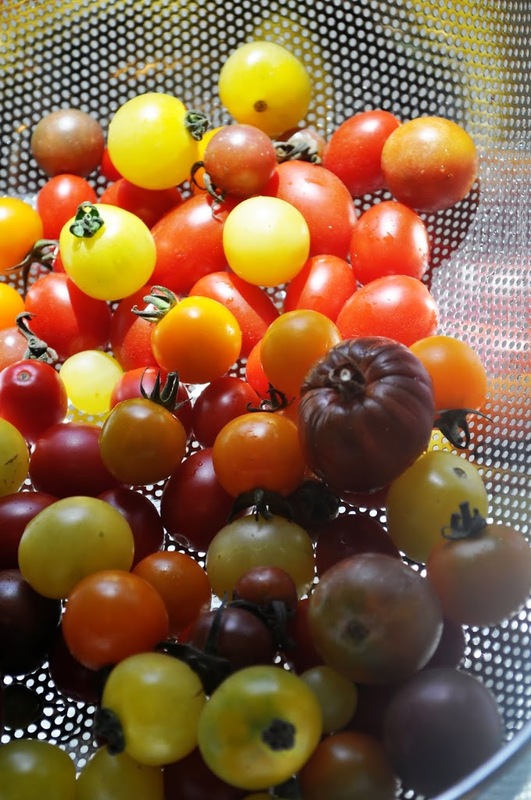 Your multi-colored tomatoes are so gorgeous!! I want an ice cream machine so bad! If I had one (or room for one), I’d be up for your cook-through-A-Perfect-Scoop plan in a heartbeat. I love David Lebovitz’s baked desserts. I’m sure his ice creams are unbelievable. Susan, this just looks absolutely delicious! I would love to sit down at your table. Everything looks just perfect! This meal looks fantastic, Susan! I’m not sure which part looks best. 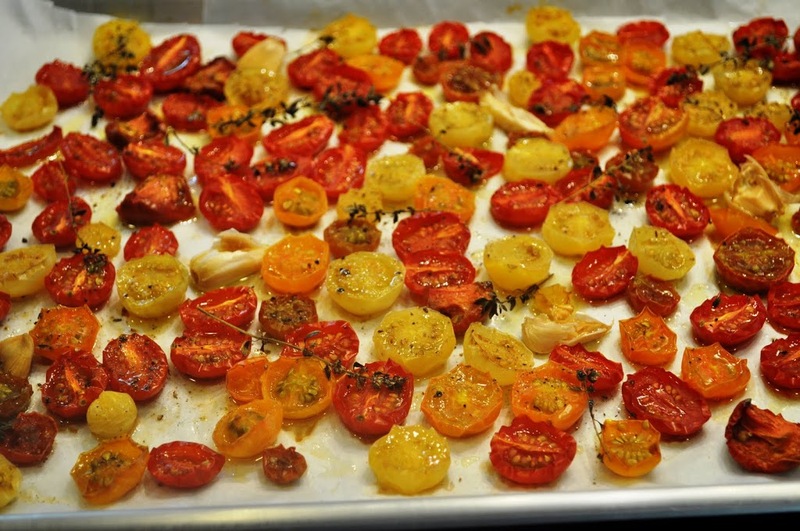 I enjoyed the slow-roasted tomatoes. They go so well with pasta, and I’m getting ideas for so many other ways to use them too. Have a great weekend! Your site is always a feast for the eyes, Susan. 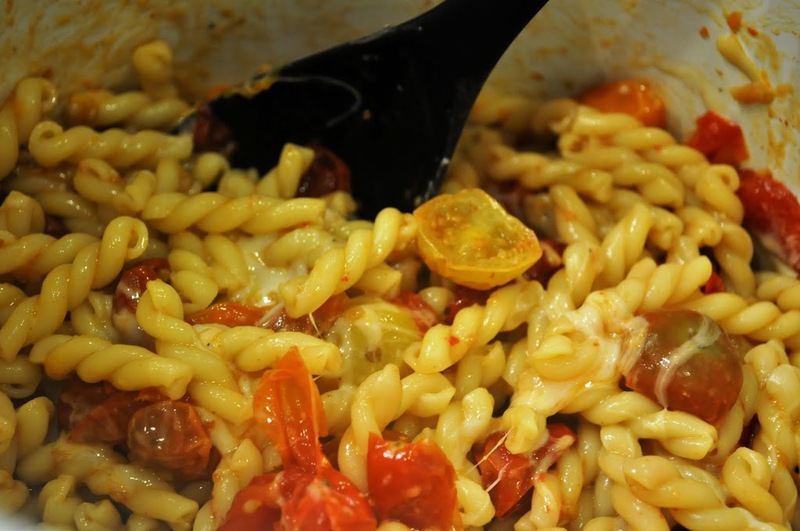 I love the cheesy pasta with the slow roasted tomatoes. The beef would (almost) be an afterthought between that and the delicious crab-cheese patty! Wow – everything you made looks fantastic. Love the colours of your tomatoes, too. I’ve got M. Lebovitz’ Ready for Dessert and love it. Your final photo is wonderful. This entire post is amazing, as are the gorgeous photos. The pasta and SMOKED mozz sound like a superb combo for those tomatoes.We liked them a lot, as did Nana. But your steak has my mouth absolutely watering. It looks stunning. Glad my family is not looking at the screen or they would be very disappointed with our chicken dinner tonight 🙂 And I have been thinking about David’s book all summer. Would love to make the ice creams though I would also love to lose about 30 lbs 🙂 Please let me know if you go for starting a group. About a year ago I bought an ice cream maker and David Lebovitz’s book The Perfect Scoop. My goal was to make ice cream instead of buying it. I have made many recipes from DL’s book and they are GOOD. Have you tried the Egg Nog? And the chocolate. He also has a recipe for salted caramel ice cream on his blog–that’s the one turning in my kitchen right now. Yummy! I’d be game for a Perfect Scoop cooking club, I just picked up an ice cream maker at goodwill for $7.00. I paired pasta with my tomatoes as well, it’s a great combo! What a packed post! Keep ’em coming! Sheesh. What a meal! Beautiful and perfectly decadent. I would love to have been at your house for this. I have been working on various ice creams lately, too, but I have not yet gotten David Lebovitz’s book. I’m thinking that it is in my near future, however. Of all people I want YOU to cook for me! I finally got around to making the tomatoes for my bison burger. I’m afraid the rest aren’t lasting long as I’m eating the rest like candy.